Day 3 of the 2014 Spring Break Burger Tour took Happy Meal and me back to The Venetian to Buddy V's Ristorante. We were hoping that B&B Burgers & Beer hadn't set the burger bar too high, and those in its sphere of influence would be able to follow suit. 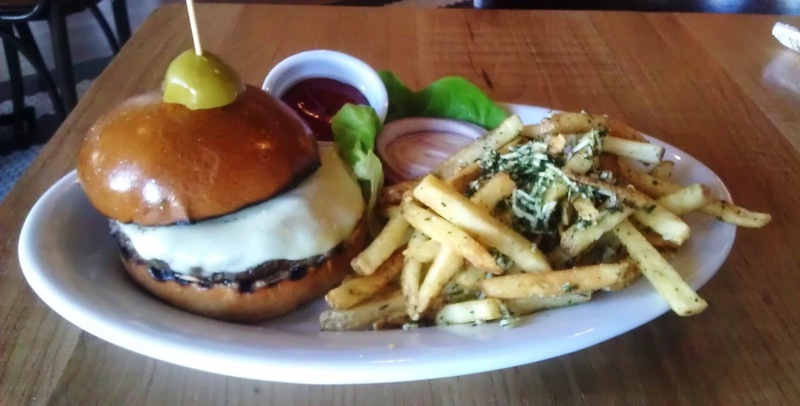 We spoke with the chef to gain an understanding of the burger. We decided to split the Angus Burger and a couple of sides. The Calamari was just fantastic. It was combined with battered lemon slivers and sliced pickle banana peppers. The tart notes combined with the savory of the spices on the generous portion worked perfectly. The sundried tomato aioli was a great touch. The Grandma's Meatballs were also excellent. These were a combination of pork, beef, and veal. The meatballs were exactly what you always thought meatballs should be but could never quite attain--the springiness was sublime. These were the gold standard of meatballs. They were served on a bed of savory tomato ragu. I would go back for the meatballs alone. Here it comes.....the Garlic Bread. The Garlic Bread was out of control. This was a decadent combination of Mozzarella, pesto, and soft Italian bread....all fried until the bread was crisp and the inside was moist and tender. This was all served on a bed of savory stewed tomatoes. This was a knife and fork affair, and even Happy Meal did not bristle at the concept. This was the finest and most subtle garlic bread that I have ever tried. It was a grilled cheese served in the style of fine dining with ingredients to match. As we ate the amazing appetizers, we watched the tight cooperation and communication between the staff in the large, immaculate, and open kitchen. Our burger arrived in about 15 minutes. The Beef: The chef shared with me that the 8-ounce patty was a combination of equal parts Brisket, Short Rib, and Chuck. This was all Certified Premium Black Angus beef from Creekstone Farms in Kansas (where I was born and raised). The fat content came in at about 20% from the supplier who ground and blended the beef for Buddy V's Ristorante. The beef was strongly beefy in flavor, and there was a low note of minerality. There was no funk from aging. The beef was cooked past the requested Med-Rare, but we didn't feel like busting stones over that. The result was a juicy burger with a bit of chewiness. The upside was the fully denaturation of the collagen, which yielded a the strong beef flavors. Additionally, there was a nice note carbon from the grill. The Seasoning: There was a mild dusting of salt on the exterior of the burger patty. 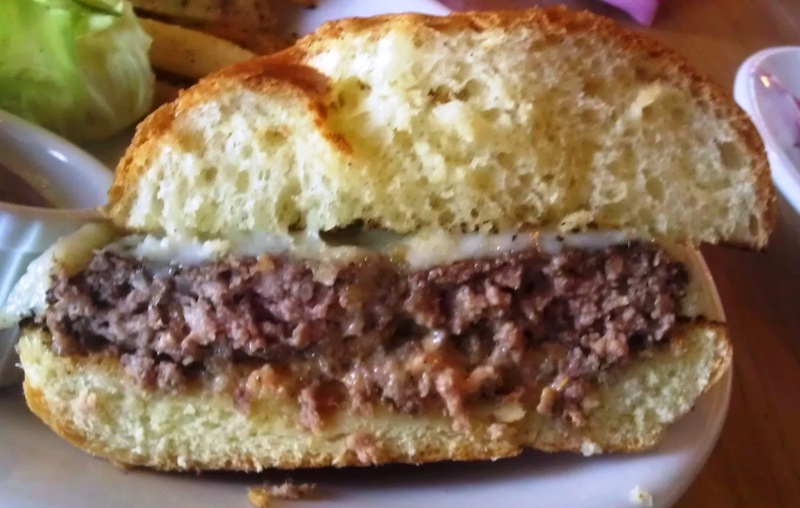 The Sear: The sear on the Buddy V's Ristorante burger was great. The sear was dark, deep, and flavorful. The sear was a winner and a fair trade for the higher than requested cooking temperature. I love a good sear. The Preparation: The 8-ounce burger patties were formed to order. The thick patties were handled gently, and this made the burger as tender as it could be. The burgers were seared on a gas-fired grill. The quality of the burger and the other dishes that we sampled showed a strong level of talent in the kitchen. 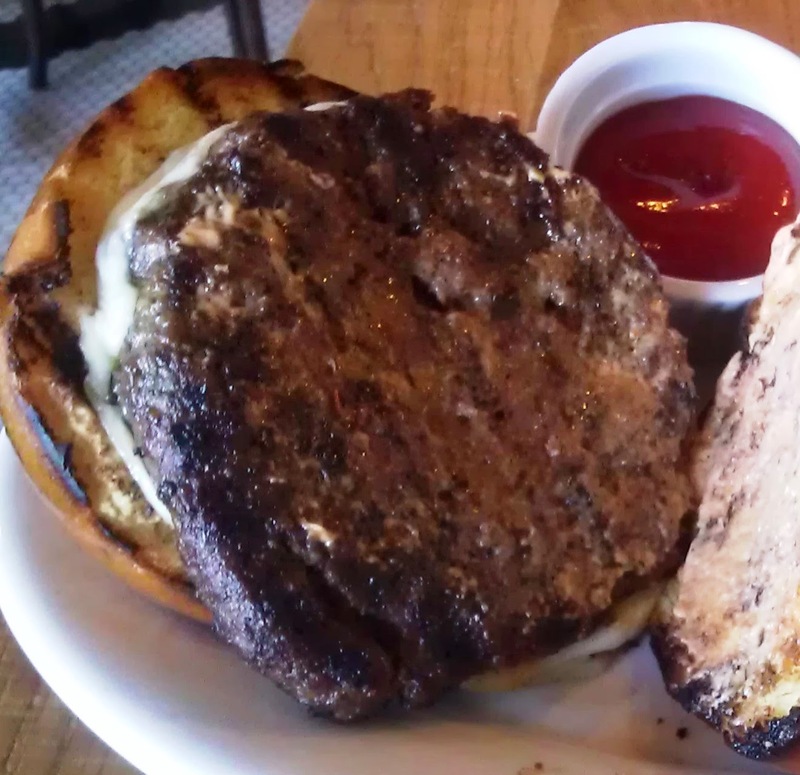 The Cheese: The Angus Burger was served with a thick slab of mild, buttery, springy, melted Provolone. The Provolone worked well to contribute moisture and a bit of creaminess to the bite. The Bun: Buddy V's Ristorante sourced the burger bun from Amato Bakery. This was the same bakery that Todd English's P.U.B. sourced their bun from. The Brioche bun was well-toasted, sweet, tender, and yeasty. The bun provided crunch around the edges. The Brioche was a little cakey in its texture, and this complemented the rich Provolone. The Fries: The "Tuscan" fries were delivered peel-on, par-cooked, and frozen. The fries were nicely crisped in canola oil to a golden brown. The crisp and flavorful fries were finished with shredded Parmesan cheese, an appropriate amount of salt, and a generous dusting of Italian herbs. The Toppings: The tomato aioli was house-made and flavorful. The Bibb lettuce was crisp and fresh. The tomato slice was ripe, juicy, and flavorful. The Value: $15 for a 1/2 pound burger with a mountain of fries was pretty much the going rate on the Las Vegas Strip. Buddy V's ingredients warranted the price. Buddy V's Ristorante served up some amazing Italian dishes and a really tasty and competent cheeseburger. Burger Review : A darn good burger at a fair price.